Minster’s wife, caterer, and part-time sleuth Faith Fairchild pairs up with Sophie Maxwell, last seen in Body in the Birches . Sophie has moved to Savannah to be with her new husband, Will. But nothing throws cold water on a hot relationship faster than a dead body. Worse for Sophie, no one believes the body she knows she saw is real. Will, a private investigator, is spending an awful lot of time in Atlanta on a case he claims is urgent, and she’s been tasked with house hunting for them with his former sweetheart, who Sophie can’t help but suspect wishes Sophie would return to her Yankee roots! Fortunately, Sophie has a good friend in Faith Fairchild. With teenage Amy being bullied by mean girls and husband Tom contemplating a major life change that will affect all the Fairchilds, Faith is eager for distraction in the form of some sleuthing. In between discussions of newlywed agita, rich Savannah customs and, of course, fabulous low country food, Faith and Sophie will pair up to unmask a killer! Put another way: protagonist, location, or plot. I’ve been thinking about these three a great deal lately in a somewhat philosophic way—receiving a lifetime achievement award, that incredible honor, seems to be making me more pensive than usual and I’m looking back at the books nounfully. Is it my series character in the person of Faith Fairchild who dominates— is the most important element? Or is it where I chose to set the books? One of the ways I’ve hoped to keep the series fresh is to alternate the locale from the fictitious town of Aleford, west of Boston, with the “someplace else “ books—France, Norway, Italy, Vermont, Maine, Manhattan, and now Savannah Georgia. Very occasionally I’ll hear from a reader who wants all the books to take place in Aleford, like Miss Marple and St. Mary Mead. Should I have made that choice? I love to travel; did I get carried away? Then there is plot. Many years ago I got up the nerve to ask my editor Ruth Cavin, who acquired The Body in the Belfry (1990) as the first mystery when she moved from Walker to St. Martin’s why she had picked my book. It wasn’t that Ruth wasn’t approachable, especially after we had had a martini or two together, but it seemed like a presumptuous question. She answered right away, “I can always fix plot”—this was very good news—“but, Katherine, I can never supply voice and yours was distinctive.” Does this mean, despite my relief, that plot wasn’t as essential as character? I think it does, although I am open to hearing other views. Same with place. Wuthering Heights not on the Yorkshire moors—or “The Hound of the Baskervilles” in Kent, the garden of England? The Maltese Falcon in Paramus, NJ—I’m a Jersey girl, so can say this kind of thing? And so on. Or are all three equally important to the mystery novel? I’m still going with Faith’s voice—or her equivalent in countless books that have been coming to mind. Person, place, or thing? Thoughts? 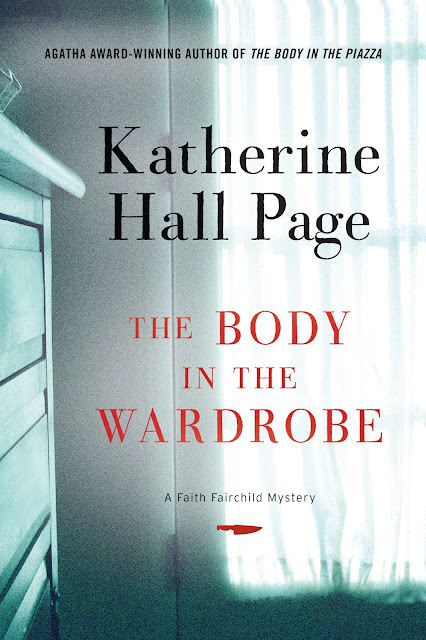 The Body in the Wardrobe is the 23rd in Katherine Hall Page’s Faith Fairchild series and her 30th book overall. She has published for middle grade and YA readers as well as a collection of short stories, Small Plates (2014), and a series cookbook, Have Faith inyour Kitchen (Orchises Press). 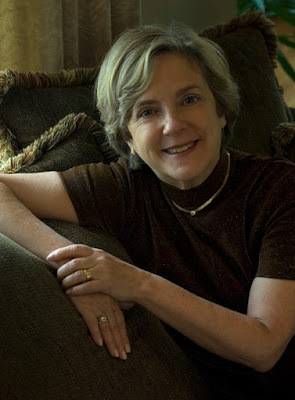 She has been awarded Agathas for Best First, Best Novel, and Best SS and also was nominated for additional Agathas, an Edgar, Macavity, Mary Higgins Clark and the Maine Writers & Publishers Alliance Literary Award for Crime Fiction. 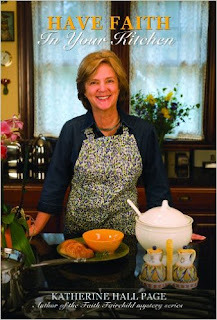 She is the recipient of Malice Domestic 28th’s Lifetime Achievement Award. She lives in Maine and Massachusetts. You can find more info and recipes at her website, and friend her on Facebook. Congratulations on your well-deserved award, Katherine. I love your series and, although each plays an important role in the telling of a story, I think I must choose person as the most important, for it is the character that seems most vital in making the story “ring true” for me. I enjoy the various locations Faith has gone sleuthing and the situations in which she finds herself, but I think it is Faith herself that defines the story. Congrats on the lifetime achievement award Katherine, so sorry I couldn't be there to see you receive it! And 30 books--wow! I agree with Joan, in most books, the character is what matters most to me. We are having William Kent Krueger as our GOH at crimebake this year--and as with your books, he's good at everything. His setting is powerful, the plots strong, but the people, especially Cork O'Connor, are what bring me back over and over. Having Faith in Your Kitchen looks like great fun! Congratulations on the lifetime achievement award! Characters mean the most to me, but an interesting setting, one I'd like to live in with the interesting characters, grabs me more than anything. Katherine! So happy to see you back! Congratulations on the new book -- it sounds wonderful. I've always felt your way of using 'exotic' locations every other book was such a smart way to keep a series fresh. Voice! Yes indeed, it's what you hear editors say over and over that they're looking for. And it's so hard to teach. Wondering, was it Ruth Cavin who 'picked' Julia's first book, too? I'm afraid I weigh in as a plot girl… But I think it doesn't matter what the plot is as much when the voice is compelling. The wonderful books I've read recently like What She Knew by Gilly McMillan and I Let You Go by Clare Mackintosh are all about the voice. It just shines through. And Katherine, what an absolute treat to watch you at Malice… Your speech was fabulous and you looked amazing, and it was just brilliant all around . Thank you Jungle Red ladies for inviting me today! And what interesting comments already.I had a feeling there wouldn't be consensus...and that's what makes thinking about these elements so intriguing. Welcome, Katherine! Hearty congrats on the Lifetime Achievement Award! The Lifetime Achievement Award Interview with Katherine was the highlight of this year's Malice Domestic. Not only because it was so nice to hear Katherine's story, but because it was clear that she was humbled by the occasion. I honestly think that it is a combination of the three elements that make a book shine. As a reviewer, I spend a fair amount of time analyzing these elements. I can't think of a time when I thought/said that a book's success was solely dependent on only one of the elements. It's the way the author weaves them together that makes the magic. That said, I will follow a character I love through a "bad" book, especially a series character. But I don't think I would keep reading a book simply because of the location - although, I do read just about anything set in Baltimore, so perhaps this is not true. As for plot, I like nothing more than a cleverly constructed storyline, especially if it can keep me on my toes throughout - a rare occurrence, but like Hank, I will sing the praises of I Let You Go (Clare Mackintosh) for the rest of the year - wow, what a book, what a "twist." My final answer is all the above! I think all three have import. I can't imagine some books set in other places. Hank's in a rural area, for example. Or Julia's in New York City. The setting has to match the "feel" you are going for in the story. Plot is important. What's happening has to be compelling and logical. But I also think that's the easiest to fix. I say "easy" and that's a relative term, but you can work with others (critique partners, editors, etc.) to patch any holes or work out the kinks. But characters and voice...those are priceless. And as Hallie says, voice is so hard to teach. But those two things, I think, are what people keep coming back for. They'll forgive a weaker plot IF those characters and that voice resonate with them (although I don't think they'll forgive weak plot, after weak plot - and some point you have to deliver there). That's what keeps me coming back book after book. My two cents adjusted for inflation. Congratulations, Katherine, on your lifetime achievement award. I haven't looked back since I picked up the first Faith mystery. I will weigh in with character as most important for me--but I look for characters embedded in a setting/culture/time that is intriguing to me. I think, when those two elements are established through a writer's distinctive voice, then plot comes organically--and by that, I mean to suggest that it's not something (i.e., the latest headline) superimposed over one's characters. As one classic example--Tony Hillerman. Tony Hillerman is a terrific example and more are popping up immediately. Elizabeth Peters for one. Katherine, congratulations on the Lifetime Achievement Award at Malice! I look at you, and I think that it can't be possible that we haven't met. I feel that we must have. But, I'm guessing that you give that aura off to many people, that welcoming smile and sweet demeanor that speaks of the kind of person we all want for a friend. I was hoping to meet you at Bouchercon this year, but I don't see your name in the list of attendees. Maybe you just haven't registered yet? Character, location, or plot? Well, I have to go with character and voice, as I will follow a favorite character anywhere. However, so often location is a part of what makes that character who he/she is and is an extension of a distinctive voice. When a setting becomes like another character, it's the best of all worlds. There are books that I'm initially drawn to because of the setting, like Peter May's Lewis Trilogy. In fact, I'm a Scottish setting fan period. On the flip side, there are books that I might not at first pick up because of the setting, which is usually a mistake. An example of that is Terry Shames' Samuel Craddock series, which I am now reading in a state of delighted frenzy. The location of a Texas small town doesn't initially appeal to me, but when I started reading the first book, the character and voice of Samuel Craddock just gobmacked me into euphoria. Now, plot is certainly a necessary element, too. If the story isn't interesting, it's really asking too much of a great character or the reader to endure it. I won't, of course, mention names, but there was a favorite series a while back that had a great character and setting, and the plots had been good, too, but then, the plots kind of went to seed, so the series became an endurance read. Oh, and on just plot alone, I, too, will have to sing the praises of I Let You Go, a book with one of the best plots (and that twist!) I've ever read. I loved seeing and hearing you at Malice, Katherine. So many congratulations on an award you totally rocked and deserved. I hope you know you are one of the main reasons I write cozy foodie mysteries at all! Katherine, Ruth Cavin said the same thing about voice to me! I've often repeated it to my writing students. As for my choice, I'd rank them: Character first, setting second, plot last. Katherine, congrats on the Lifetime Achievement Award! What an honor! I wish I'd been there. I'm in Ruth Cavin's camp. I think anyone can learn to plot--although some maybe better than others! But I don't think voice can be learned--it's even hard to explain. But it's what makes books unique. Character is probably second on my list. I will follow a character I love from place to place. And I will read for setting, but won't stay with a book unless the voice and the character grab me. Katherine, you hit one of my absolute favorites--Madam, Will You Talk? I've tried to take that book apart and see how she managed to write that story--and it's not even that long and it was her first. Hard work certainly plays a part, but talent must comes in somewhere--perhaps in the ability to 'hear' and sustain voice. Because I don't think we can consciously create it, but lack of voice is what makes so many books derivative. If it is a book by a author I have not read plot sells followed by place. I will read many books set in a place I have a connection to. But person and how that person fits in the place and tells me their story will determine if the book is good. The author who can deliver all three will have me coming back for more. Seems like I left out plot from my little list. And voice. I just read a book that near the end, the author switched voice. She wrote in the first person all the way through till a few chapters near the end, when she suddenly switched to third person. It's like reading another book, entirely. I wonder if she did that for effect? Katherine, it is lovely to e-meet you. I have been a fan for a long time. Person, place, or thing? All three, and just as in a good cocktail, in varying degrees to hit the right note for the right book! You are always on the mark. This has been such a fun day and again, many thanks to Jungle Red for the invitation. Reine, did the switch work for you? It must have been intentional and I'm wondering whether it produced a significant effect. It's an interesting idea if handled well. Katherine, it worked very well for me, because it enabled me to move to the place where a reader must go when a change of perspective is necessary in order to fully understand the story. I found it captivating as it was told, but the ending section was great for its using this change in voice to redirect with a new perspective on the whole of the book. It was wonderful to meet you at my first Malice. Congratulations on your lifetime award!